Astronomy Science ~ NASA has announced that the Orion spacecraft, known as the Orion Multi-Purpose Crew Vehicle will soon begin its first flight test. The spacecraft is scheduled to make its first test flight. If it goes according to plan, this aircraft spend a few hours to orbit the Earth. The next generation of aircraft is specifically designed to take astronauts farther into space than anyone who ever blasted off into space. NASA hopes that the spacecraft was able to land a crew on the Moon around 2020. In 2025, Orion will carry astronauts to asteroids and 2030, the spacecraft will carry astronauts to Mars !! The aircraft is designed to carry up to 4 crew farther into space and keep them persistence on the way. NASA Orion spacecraft is one of the most impressive exploration vehicle ever proposed and made. The launch site at Cape Canaveral Air Force Station in Florida. 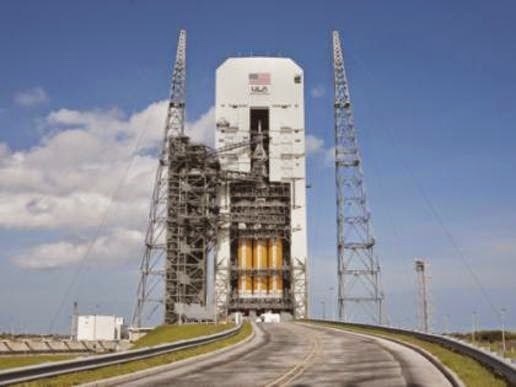 After reaching space, Orion will take 4.5 hours to orbit the planet twice. During this time, he will be traveling at an altitude of 3,600 miles (5,800 kilometers). After traveling through space is completed, Orion will return to earth. The spacecraft is expected to enter the atmosphere of our planet at a speed of about 20,000 miles per hour (nearly 32 200 kilometers per hour) and with the aid of a parachute system, he would have landed in the Pacific Ocean.